Britain’s influence in the sporting field across the globe in the 19th and early 20th centuries led to the blood of our hound breeds being extensively exported, Foxhounds especially. 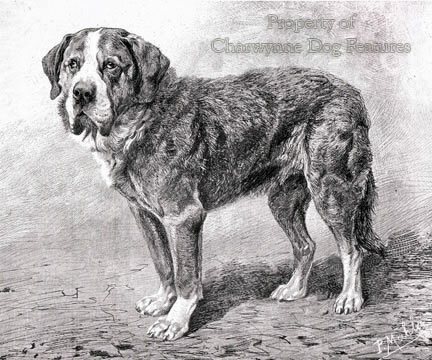 Their impressive physical stature, allied with great staying power and backed by nose and voice, made them desired all over the world, to improve their local hunting dogs, from Sweden and Finland in the north, across the channel to France, and even further afield to America, Australia, South Africa and India. Packs of them have been deployed from Gibraltar (the Calpe Hunt) to Tasmania (the Hobart Hunt). It would be wrong however not to mention early in this section, one distinctive Irish hound breed, the Kerry Beagle, used in the Scarteen pack; greatly admired in the UK over many years and providing good hunting for many sportsmen from Great Britain. Black and tan Harriers, with other colours allowed – the first show champion, in 1993, was a blue-mottled dog, Cloudy Fellow - not Beagles in our sense, and like, say, the Tara pack in size, they are claimed to have a continental origin rather than a British Isles background. On the move, they remind me very much of the Dumfriesshire Foxhounds, albeit in a smaller form. May they long continue. In her book In Nimrod’s Footsteps of 1974, Daphne Moore mentions another black and tan pack in Ireland, the Naas Harriers. She also refers to The Kilkenny Hounds, famous for their strong muscular backs, with an hereditary trait – a spine of ‘cloven’ muscle running along the topline; I have heard old hound experts stress the capability of being able to roll a billiard ball along a standing hound’s back, from withers to rump, without the ball falling off to one side. Strength in the back gives a hound far greater running power. The rich heritage behind our native scenthounds, together with the ease of introducing superlative reinforcements from just across the channel, has perhaps led us to overlook talented hound breeds from further afield. With more foreign scenthound breeds now becoming known in Britain: the Basset Fauve de Bretagne, the Hamiltonstovare, the Grand Bleu de Gascogne, the Bavarian Mountain Hound, the Norwegian Lundehund and the Grand and Petit Bassets Griffon Vendeen all introduced fairly recently, we are becoming less insular in our outlook. When working and living three times in Germany, I came across the German, Austrian and Swiss hounds and found much to admire in the Alpine Dachsbracke, the Austrian Hound, the Hanoverian Hound and half a dozen Swiss hound breeds, large and small. At the World Dog Shows in Vienna and Dortmund I learnt of the Styrian Mountain Hound – still sometimes called the Peintinger after its creator, the Tyrolean Hound and the imposing Brandlbracke or Austrian Black and Tan Hound. It’s alarming that in Austria, three times as many Golden Retrievers are registered annually as their charming native breed, the Alpine Dachsbracke. We must all conserve our native breeds, they are part of our heritage. The Scandinavian and Baltic hound breeds were very much in evidence when the World Dog Show was held in Helsinki in 1998, with the Finnish Hound attracting a huge entry of impressive hounds. The Baltic hound breeds are, not surprisingly, much alike, with the Estonian, Lithuanian and Latvian (Courland) native scenthounds resembling tricolour Foxhounds in conformation. The black and tan Lithuanian Hound is gradually becoming better known, with distinct similarities to the scenthounds further south. Until quite recently, the Lithuanian hunters using this breed never showed interest in dog shows or even registered their stock with the national kennel club. The Balkan breeds: the Istrian (in two coats), the Posevac or Posavski Gonic from Northern Bosnia, the Slovene and the Montenegran Mountain Hounds have distinct similarities too, with the Greek Hound having a comparable appearance. The break-up of the former Yugoslavia has led to each emergent nation renewing its interest in the native hound breeds long established there, with the Yugoslavian Mountain Hound providing yet another variety. It was an Istrian Hound from Slovenia that came first in the solo trial at the 1998 Coupe d’Europe des Chiens Courants’ hunting trial, staged by the FCI’s Hunting Commission, held south of Vienna, with 5 of the top 10 hounds coming from Slovenia and Croatia, no mean feat. In Budapest for the World Dog Show, I came across the Polish and Hungarian breeds undergoing a revival in their native countries. With the break-away of the Iron Curtain countries, scenthound breeds like the Ogar Polski (mainly tan) and the Gonczy Polski (black and tan) in Poland and the Erdelyi Kopo or Transylvanian Hound (in two sizes, 22-26 inches for wolf, bear, stag, lynx and boar and 18-22 inches for hare and fox) of Hungary, two quite similar breeds in type, have been promoted. The Slav influence across borders can be seen in the scenthounds ranging from Slovenia due south of Austria, into Austria itself and on into Serbia and further south. Not surprisingly, the anatomy suits the role of the hound, wherever it’s employed. As these countries become increasingly both urbanised and westernised, care needs to be taken that such valuable hunting dogs are not briefly celebrated as national emblems then discarded as interest wanes. Here, our KC recognises the Foxhound but not the Fell Hound, the Welsh Hound, the Harrier or the English Basset. If some of these types are not to be hunted in the future, it may well be a question of deciding whether a show ring future is better than none at all. The Otterhound now features in the show ring as well as in the minkhound packs. Is it not better to conserve genes and await more enlightened times? The sporting dogs of Switzerland are little known away from their native country. Not one is recognized by our Kennel Club or utilized by our sportsmen. Yet they are prized by Swiss sportsmen, with their wide range of hare-hound offering unrelated blood in the improvement of the genetic diversity of some of our hound breeds. The Swiss hounds have developed under the influence of those countries adjacent to the various Swiss regions and are sensibly bred to suit the terrain of a region rather than the country as a whole. In this way, we can see the influence of the French hounds in the Jura hounds, of Bavarian hounds in the Lucernese hounds, of German hunting dogs in the Bernese hounds and a more general European look to the Swiss national variety. In each of these four groups: Jura, Lucernese, Bernese and Swiss, there is a Harrier-sized hound or Laufhund and a Beagle-sized hound or Niederlaufhund. The four types of Laufhund are in the 17" to 22" height bracket, whilst the four types of Niederlaufhund are in the 12" to 15" height bracket. 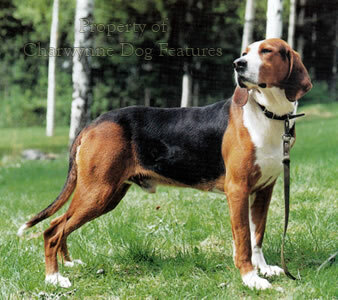 The Lucernois or Luzerner Laufhund is similar to the Bavarian Mountain Hound and related to the Hanover Scenthound, and was developed for tracking chamois for the gun, not as a quarry hound. The Swiss Hound, Schweizer Laufhund or le courant Suisse commun has proved popular in Norway, with the smaller variety 'improved' by using Dachsbracke blood. The Bernese Hound or Berner Laufhund is usually bigger than the other native hound breeds, with far longer leathers. They resemble the Steinbracke of Germany. The fourth variety the Jura Hound or Laufhund comes in two types, one called the Bruno de Jura and the St Hubert type. Used to hunt the hare and to drive game to the waiting guns, there is a slight resemblance to the smooth variety of the Italian Segugio. The latter is now recognised by our Kennel Club if not by our sportsmen. In Spain the Alano has only just survived the 20th century, at one time the last two were believed to be those exhibited in Retiro Park in Madrid in 1963. But then some were discovered in Cantabria, in the western area of Vizcaya, in the Carranza and Llera valleys. The breed was originally used as a hunting dog, in the classic catch-dog role of the broad-mouthed breeds. They were used as cattle driving dogs, especially with half-wild cattle. They were used until the mid-19th century in the bullring, in one of the phases of the bullfight known as the 'dogs' turn'. Not surprisingly the breed was mainly used, in the hunting field, in the 'gancho' method of hunting boar, in which the dogs 'held' the boar until it was despatched by the human hunter's knife. Around 25" at the shoulder and weighing between 35 and 45 kgs, the ones displaying the fawn coat, black mask and black muzzle could be mistaken for Bullmastiffs at first glance. The Sabueso is the Spanish scenthound, coming in two sizes, the Sabueso Espanol de Monte or Mountain Hound, a large, heavy-boned, long-eared hound, once used by the Spanish police as a man tracker, and the Sabueso Espanol Lebrero or hare-hound, usually white and red, the size of our Harrier. Any hound capable of working successfully in sub-Arctic conditions, treacherous mountain terrain and in huge expanses of largely uninhabited regions surely demands our admiration. Why then have the ‘spitz-hounds’ not attracted our interest? Books on hounds usually overlook the Northern breeds, which can range from the Elkhounds of Scandinavia to the bear-dogs of Karelia. Somehow the appearance of such hounds, with their prick ears, thick coats and lavishly-curled tails, doesn’t immediately fit our mental image of a scenthound. The Finnish Spitz is already well known here, with 36 newly registered with the Kennel Club in 2010, but only 10 in 2011. They have been grouped with the Hounds by the KC, but as a ‘bark-pointer’ should perhaps be allotted to the Gundog Group. 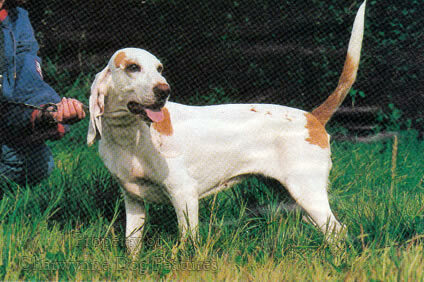 This attractive little breed is a most unusual, for us, that is, hunting dog, in a style not utilised in Western Europe. The dog is used in heavily wooded areas where it uses sight, scent and unusually good hearing to locate feathered game, upland game such as grouse or capercaillie. The location of the quarry is ‘pointed’ by a special stance, four-square with tail up twitching with excitement, head back and giving voice – a distinctive singsong crooning bark, which is sustained, both to mesmerize the prey and attract the hunter. This ‘point by bark’ has to be audible to the hunter, who may be some distance away, and more importantly to ‘freeze’ the bird. The Finns claim that the tone of the bark, the agitated almost hypnotic waving of the bushy tail – and even the small white spot on the dog’s chest, hold some kind of fascination for the bird, which watches intently from the relative if temporary safety of its perch. There are similarities here with the flamboyantly-waving tail of the old red decoy dog of East Anglia, used to lure ducks for the hunter. The Finnish Spitz has the same rich rufous, almost red-gold coat, mobile ears and highly inquisitive nature. Just as this breed is the national dog of Finland, so too is the Elkhound that of Norway and the Hamiltonstovare (the word stovare coming from the Low German stobern – seeking or tracking) that of Sweden, a breed used as a single tracker, i.e. used alone to follow a track not as a pack hound. Thirty years ago, we began to show an interest in a handsome Swedish scenthound breed, the Hamiltonstovare, very similar, at first glance, to the Finnish Hound. Eight were registered in 1984, 21 in 1990, 31 in 1991, only 6 in 2010, then 27 in 2011 but only 6 again in 2012. These figures are not reassuring; this is an attractive breed, but, as always, hound breeds are not ideal pets for those with no sporting facilities. Here, from the ringside, I’ve been impressed by an import Santorpets Tessie at Sufayre, every inch a hunting dog. This breed was created by a devoted sportsman, bred specifically for a sporting function and one needing exercise, stimulation and above all, scent. This breed is used as a single working hound for finding, tracking and driving hare to the guns, with the hunters using horns to communicate, but relying on the baying of the hounds for information too. They just don’t look at home in a suburban street. There are over eight breeds of native hunting dog in Sweden, ranging from the better known Grey Elk Dog or Jamthund, a handsome cream-marked grey, (only recognised in 1946 but widely used in hunting trials), the Swedish White Elkhound (nearly 800 registered each year), the little known Ottsjojim, an elkhound of Jamthund type, to the well established Drever, or Swedish Dachsbracke (between 12 and 16 inches high), the bigger black and tan Schiller and Smalands Hounds and the Hamiltonstovare. Not surprisingly, the non-spitz hounds greatly resemble their Norwegian equivalents: the Halden (only 6 registered in 1980, against over 600 Schillers and 290 Smalands), Hygen and Dunker (now the Norwegian) Hounds. 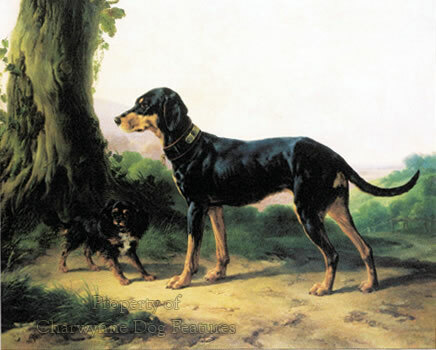 The German influence can be seen in a number of these, with the bob-tailed Smalands looking very Rottweiler-like, even though scenthounds in Germany are not numerous, as hunting dogs, or popular as pets. As hunting dogs they are famed trackers, not hounds of the pack. Sweden also boasts a small hunting dog, the Norbottenspets, used in hunting rabbits and hares. It is not always easy to identify these breeds, the climate and the conditions has shaped them and their similarity of form is understandable. The best-known Spitz-hound in Britain is the Norwegian Elkhound, although its fortunes have varied. Ten years ago, 149 were newly registered with our KC; in 2010, just 33, 62 in 2012. Comments on the entry at championship shows in 2011 by judges of this breed give concern. These range from “Upright shoulders and wide chests accounted for bad front movement and incorrect rear angulation prevented the correct drive from behind” and “…loose elbows and pasterns were evident in most exhibits” to “Hind movement overall was not good, particularly in the males…they were straight in angulation in front and rear and therefore lacked both reach and drive.” The Norwegian hunters I met disapproved of too straight a stifle, arguing that such a feature made the hound ‘use its back too much’ and lacked endurance as a result. A 2012 show critique expressed concern about ‘an ever diminishing gene pool’ and the necessity to introduce new bloodlines ‘to preserve the breed as we know it’. We all know that this is a breed that relies on endurance and these judges’s criticisms are worrying for the future of the breed here, famous as a working hound. I believe one has been used as a locator of people buried under snow by the Scottish Mountain Rescue Services. The Elkhounds I have seen in Norway looked stockier and shorter-coupled than those I saw in the United States, where I was saddened to see them lighter and finer-boned – and expected to ‘gait’ at speed in the ring, rather like Siberian Huskies. I don’t think Norwegian elk-hunters would want their precious dogs to perform in such a way! Hounds like the Norwegian Elkhound have been used for centuries to hunt bear, elk, reindeer and the wolf, but it was not until 1877 that they were recognised as a breed there. Only those that qualify in hunting trials may be awarded the full title of champion. This surely has to be the way ahead for all sporting dogs if they are to be retained as such. The Elkhound hunts mainly by scent, working silently to locate its prey, which it then holds or drives towards the hunters. As it doesn’t actually ‘catch and kill’ its quarry, strictly speaking it shouldn’t be classified as a hound. (But under our own Hunting Act, aren’t all hounds now gundogs?) Usually a shade of grey, with black tips, a black cousin is found in the Finnmark area, with a shorter coat, looking taller and lighter than the Norwegian breed. I saw some sixty years ago when exploring the Jaeggevarre ice-glacier region; the local hunters called them Sorte Dyrehund - they were leggy and thick-coated, hinting at great robustness and stamina. There is also the Halleforshund, an elkhound breed that is red-coated with a black mask, more like one of the laika breeds further east. The Russians have their own laika or point-barker hunting dog breeds, with regional differences between the West Siberian from the Northern Urals, the East Siberian, from the huge forests there and the Russo-European varieties. 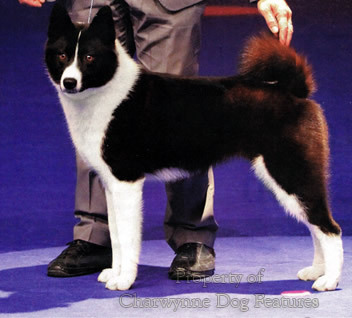 At World Dog Shows, especially the one held in Helsinki, I have been impressed by the Laika type, especially the imposing Karelian Bear Dog, a sturdy mainly black breed, used for hunting the bear, lynx and elk, but prized especially on sable. Determined, fiercely-independent and immensely resolute, which is hardly surprising when you think of their bigger quarry, they have a very acute sense of smell and superb long-sight, picking up movement at extreme distances. This breed originated in Karelia, a territory stretching from north of St Petersburg to Finland, with the Russian breeders adding Utchak Sheepdog blood for greater resistance to the cold. Twenty two inches high and around 55lbs in weight, they were originally used to hunt elk, then later to hunt bears and large game. They are related to the Russo-European Laika, often being black-coated and with a similar broad head, but easily confused with the hunting dogs from further east: the Western and Eastern Siberian Laikas. These hunting dogs have quite remarkable resistance to low temperatures and their past value to peasant hunters, especially before the arrival of firearms, must have been immense. I am told that around 70,000 hunting Laikas are in East Siberia alone, with those used on feathered game selected for air-scenting, those used on fur or hoof bred for ground-scenting skill. Both the bear and the elk are formidable adversaries, with even the baying dogs being regularly killed by them. An elk, or moose in North America, is the largest living deer, about the size of a horse; the bull can have antlers of up to 40 points. The use of dogs for elk-hunting in northern Europe has a long history. It took two forms: one with wide-ranging free-hunting small packs (loshund) and another with dogs on a long leash (lurhund or bandhund) following a trail. The latter demanded close cooperation between dog and handler, to make full use of the wind conditions and not to startle the quarry into hasty retreat. The hound must not give tongue or the elk accelerates and can be lost. Hunting bears too was not a practice for the fainthearted in times when only primitive weapons were available. Canada had an equivalent to the Karelian Bear Dog, the Tahltan Bear Dog, used by the Tahltan Indians of British Columbia, south of the Yukon and flanked by Alaska. It was used in packs to hunt black and grizzly bears and the lynx. Even more specialist was the Norwegian Lundehund, used to hunt puffins on coastal cliffs. Uniquely, this breed has the ability to fold its ears shut, using a cartilage around the ear-rim, and, six toes on each foot, rather than four. Hunting for puffins’ nests clearly demands extra features in the hound!